Long before "women in rock" became a media catchphrase, Rosetta Tharpe proved in spectacular fashion that women could rock. Born in Cotton Plant, Arkansas, in 1915, she was gospel's first superstar and the preeminent crossover figure of its "golden age" (1945-1965). Everyone who saw her perform said she could "make that guitar talk." Shout, Sister, Shout! is the first biography of this trailblazing performer who influenced scores of popular musicians, from Elvis Presley and Little Richard to Eric Clapton and Bonnie Raitt. An African American guitar virtuoso, Tharpe defied categorization. Blues singer, gospel singer, folk artist, and rock-and-roller, she "went electric" in the late 1930s, amazing northern and southern, U.S. and international, and white and black audiences with her charisma and skill. Ambitious and relentlessly public, Tharpe even staged her own wedding as a gospel concert-in a stadium holding 20,000 people! Wald's eye-opening biography, which draws on the memories of over 150 people who knew or worked with Tharpe, introduces us to this intriguing and forgotten musical heavyweight, forever altering our understanding of both women in rock and U.S. popular music. Gayle F. Wald is a professor at George Washington University and the author of Crossing the Line. She wrote the liner notes for a critically acclaimed 2003 Rosetta Tharpe tribute album. Wald lives in Washington, D.C.
"A book like this is long overdue. Rosetta Tharpe was a major star and a huge influence on the musicians of her day. Listen to her recordings and you can hear all the building blocks of rock and roll." "Rosetta was one of the most beloved and influential artists ever in gospel music... and she blazed a trail for the rest of us women guitarists with her indomitable spirit and accomplished, engaging style. She has long been deserving of wider recognition and a place of honor in the field of music history." "Rosetta Tharpe was one of my first influences, one of the first people I heard sing. I'm glad Gayle Wald has done a book on her because people need to know." "Rosetta Tharpe was larger than life--but sometimes, as Gayle Wald tells the story, she was larger than herself. Wald's account of Tharpe's 1951 marriage in Griffith Stadium in Washington, D. C.-she signed a contract for the wedding, then went looking for the husband-is a classic American tall tale, except that it happened, and, in these pages, you are there." "Wald digs deeply into sensitive personal, cultural, and artistic issues to capture the essence of both the individual and the performer while deftly examining a variety of elements that impacted Tharpe's life and work - from the challenges of being an African American woman to the strictures of the religious environment that gave rise to her gospel sound. This candid and thorough biography will certainly appeal to those familiar with this accomplished performer and will inspire others to seek out her recordings." 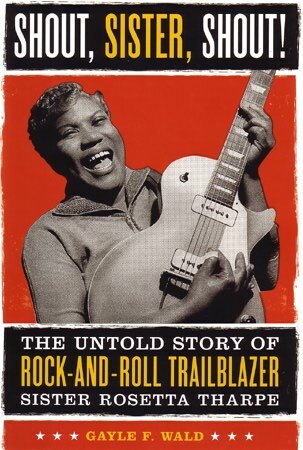 "With the publication of this entertaining and enlightening biography, Tharpe - who reputedly played her electric guitar "like a man," withstood failed marriages, racial and sexual discrimination plus economic hardships - should receive the recognition she deserves." "Ward's illuminating biography brings the deliciously flamboyant singer to life as gospel's first superstar and a seminal figure defying musical categorization."